Many people think that winter is the only time we need to worry about our skin and moisturizing… but that just isn’t the case. Changes in temperature, humidity and other environmental factors can lead to dry skin all year round. When the weather gets warmer, not only do you need to worry about moisturizers but you also need to worry about protection. 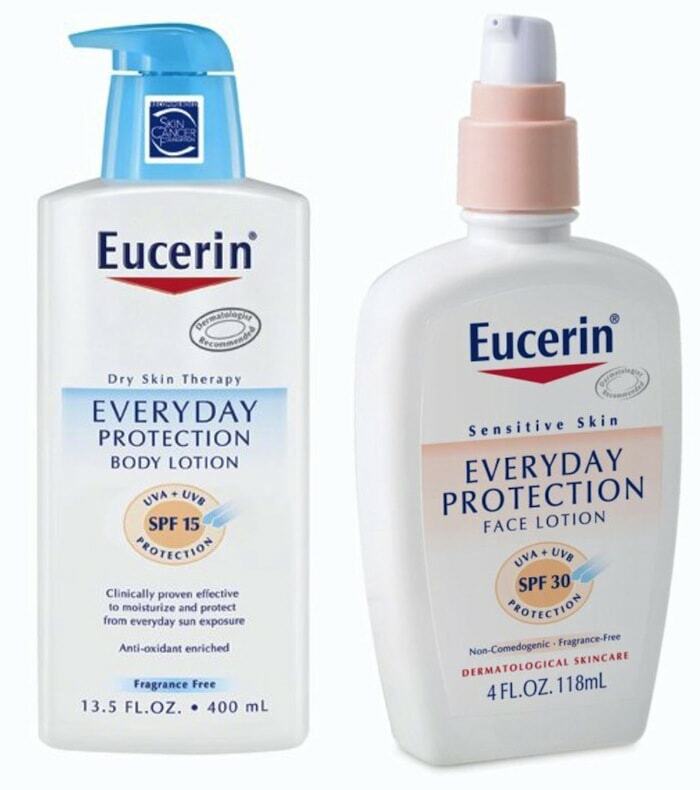 Eucerin Daily Protection SPF 15 Body and SPF 30 Face Lotion will handle BOTH. Spring can be filled with lots of different activities; whether running around sports, or just taking it easy and relaxing. As you plan outdoor activities for your family, it’s important to remember your skin needs daily protection so you can prevent skin problems later in life. Skin care also involves cultivating skin health from the inside out. A healthy diet consisting of fruits, vegetables, lean protein and high-fiber grains will help get you ready to show your skin this spring. Are you unsure of what Eucerin skin care products to use for your skin type? Well if the answer is yes, then we have the right tool for you! Eucerin just launched their new SkinDicator app that recommends a product based your SkinDicator quiz results. Still wondering about which Eucerin product to try, Eucerin’s Facebook page, offers a Digital Dermatologist that will answer their questions and guide them to healthy looking skin. Finally, I wanted to share a wonderful “Dear Eucerin” video with you that Eucerin created to thank its customers for inspiring them for 111 years to create products and programs to help them make better decisions around skin health. Here is the link to the video…hope you enjoy! TAKE NOTE: As an added bonus for Lady and the Blog readers, you can get a FREE sample of the Eucerin Daily Protection Moisturizing Lotion to help refresh their skin and keep it looking healthy. To get the free sample, all they have to do is “like” the Eucerin Facebook Page and follow the instructions on how to take the Eucerin Skin First Pledge. One (1) lucky Lady and the Blog reader will receive a “Spring Has Sprung” kit on behalf of Eucerin. This package includes the Eucerin products below as well as a $125 Visa Gift Card. Eucerin Daily Protection Moisturizing Body Lotion Sunscreen SPF 15 (13.5 oz.) – Helps protect skin from daily sun exposure with a lotion specifically formulated to moisturize and protect. This light, fast-absorbing formula with SPF 15 sunscreen provides 24-hour moisture and helps defend against sunburn. Eucerin Daily Protection Moisturizing Face Lotion Sunscreen SPF 30 (4 oz.) – This lightweight, gentle broad spectrum SPF 30 formula with UVA/UVB sunscreens including zinc oxide and titanium dioxide helps defend against long-term sun damage and also provides effective moisturization. Become a fan of LAB’s Facebook Page. Then leave a comment on the wall saying you entered the Eucerin $100 Visa gift card and “Spring Has Sprung” pack giveaway. Tweet this message: “Hope I win the @EucerinUS $100 Visa card Spring Has Sprung giveaway from ladyandtheblog.com (@verasweeney). RT to Enter #contest #giveawa”. Like Eucerin on Facebook and leave a comment saying you are entering the Eucerin $100 Visa gift card and “Spring Has Sprung” pack giveaway on ladyandtheblog.com. Winner(s) will be selected at random. Open to US Residents 18 years and older only. Eucerin provided a “Spring Has Sprung” pack as well as $125 Visa gift card for Lady and the Blog LLC to keep as well as to give away. I am already a fan of Lady and the Blog on Facebook. I already follow Lady and the Blog. i like eucerin on facebook! I follow you on networked blogs as Mary Happymommy. I’m a fan of Lady & the Blog on Facebook! I just entered on the form! And signed up for the newsletter. I already subscribe to LAB’s newsletter. Follow on Networked Blogs as Mary Happymommy. commented on Daily Diary: Where Did The Time Go? commented on Tommy Bahama Restaurant – Where Have You Been All My Life? Subscriber to the LAB’s newsletter. I filled out the form again today 4/6. I follow you on Networked blogs Claudia N.
Follow Lady and the Blog on NetworkedBlogs.com! I stumbled this page. My name is alliciac. already filled out the form. elena150980 at yahoo dot com. I’m a fan of LAB’s Facebook page and left a note about entering the giveaway. Followed Lady and the Blog on NetworkedBlogs.com! Follow you оn Networked Blogs. I am already subscribed! Thanks! I subscribed, facebooked and tweeted! Love this product! Thank you so much! Love this product! Hope to win! Entered your contest. Love this product. Hope to win. Facebook fan and wrote on your wall, hope win! I love Eucerine. I have even recommended it to others. Networked Blogs follower as Sarah B.
I liked you on facebook and wrote on your wall! Facebook fan wrote on both walls ! Posted on Eucerin Facebook wall. Posted on LAB’s Facebook Page wall. I LIKE Eucerin on FB ad=nd entered to win the Spring gift pack giveaway. I follow Lady and the Blog on networkedblogs.